(for detail of this section see Ogino, Tomisaka, & Nakamura 1999). Figure 4.8: Mass accretion rate against the typical density of the cloud. This indicates that the accretion rate is proportional to , while the time scale is to . This is confirmed by hydrodynamical simulations of spherical symmetric isothermal clouds (Ogino et al.1999). When the initial density distribution is the SIS as , the mass included inside is proportional to radius . In this case, equation (4.81) gives a constant accretion rate in time. In Figure 4.8 we plot the mass accretion rate against the cloud density. represents the cloud density relative to that of a hydrostatic Bonnor-Ebert sphere. 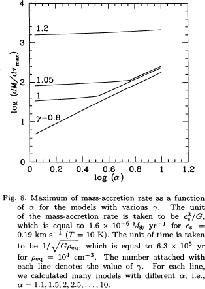 This shows clearly that the mass accretion rate is proportional to for massive clouds . This is natural since the assumption of pressure-less is valid only for a massive cloud in which the gravity force is predominant against the pressure force. as shown in Figure 4.9. Since the free-fall-time of the gas contained in the inner core is the same, such gas reaches the center once. It makes a very large accretion rate at as . If , for . Since and , equation(4.81) predicts . A constant accretion rate is expected for this power-law and the accretion rate is converged to a constant value after . If , for . Since for this power and , equation(4.81) predicts . They gave for . Figure 4.9: A model proposed to explain time variation in accretion rate by Henriksen, André, & Bontemps (1997). The density distribution at (left) and expected accretion rate (right).